Wohoo there's another "Free Friday" coupon available! 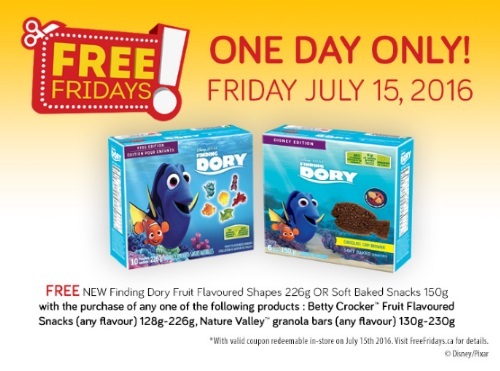 Claim your coupon below for a Free Finding Dory Fruit Flavoured Shapes or Soft Baked Snacks when you purchase select Betty Crocker Fruit Flavoured Snacks or Nature Valley Granola Bars! This is a mail coupon from Save.ca available for a limited time. This coupon is only valid and redeemable on Friday, July 15, 2016! Please note you can get this coupon from the Walmart coupon portal as well. Get the last Free Friday coupon that they released last week here for a Free Old El Paso Tortilla Bowl.